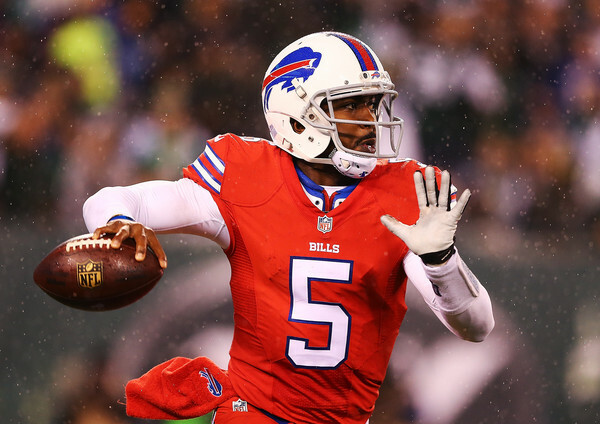 There’s a likely scenario in which the Buffalo Bills release Tyrod Taylor as they head in a new direction once more. Looking at the bigger picture, it puts a legitimate starting quarterback on the market, which makes the San Francisco 49ers, Cleveland Browns and New York Jets. Taylor has done well for the Bills when he’s healthy; a dual threat quarterback who is explosive in open space, and does a good job of moving the chains in the air as well. The former Virginia Tech player has completed 62.6% of his throws in 29 games for the Bills, throwing for 37 touchdowns and 12 interceptions, adding 1148 yards on the ground, averaging 5.8 yards per carry. Maybe he’s not Russell Wilson, but for teams that don’t have a Super Bowl right away on their mind, Taylor is a terrific solution. The Bills could eventually try and trade him instead of cutting him, but the main interest in him from the mentioned teams is for free agency. Jimmy Garoppolo won’t be on the trading block from current rumors, while Tony Romo mainly interests teams who believe they have a strong enough roster to compete right away, and that includes the Bills, who let things with Taylor get out of hand late last season. With Rex Ryan gone, there isn’t a whole lot of love between Taylor and the front office. The most desperate team for a quarterback are the 49ers, who will be heading into the 2017 free agency period with a single QB on contract. The players they’d hoped to be chasing: Kirk Cousins and Garoppolo, aren’t going to be available. We’re probably going to see them going after at least one semi-useless veteran like Matt Schaub, but they’re very intrigued at the possibility of Taylor. You can say the same about the Jets, who have a bad history with “running” quarterbacks, although an aging Michael Vick and a benched Tim Tebow isn’t seriously trying. The Jets have Christian Hackenberg and Bryce Petty on the payroll for next season, two guys they don’t see as starting quarterback material. Not now, probably not ever. Taylor is someone they’ve seen up-close over the last two seasons, and believe that they’re a few easy fixes from being in the playoff hunt again, now that the Ryan Fitzpatrick short era is over. And on to the Cleveland Browns, with Robert Griffin, Cody Kessler and Kevin Hogan on the payroll. Not exactly the kind of names a team looking to find someone they can trust for more than one season. Taylor should be capable of giving them that. He’s not going to be cheap, which could be an issue for both the 49ers and Browns in terms of principal, while the Jets don’t have a whole lot of money to spend. First of all, he needs the Bills to actually release him and put him on the market. Now that Garoppolo isn’t available anymore and Tony Romo is probably closest to finding a path towards the Denver Broncos, keeping Taylor doesn’t sound like such a terrible idea.